What is walnut? Why do we need it? Walnuts are the dried, ripe seeds of the walnut tree. Originally native to the Middle East, walnut trees are now found worldwide. The word "walnut" is derived from the Old English "wealh," meaning strange or foreign. There are about 15 edible varieties of walnuts, although they are almost identical in appearance. The typical walnut consists of a hard outer shell (ranging in color from light brown to black), which contains a woody nut enclosed in a thick, fibrous husk. Some nuts have thinner shells; others have nut kernels that range in taste from almost sweet to bitter. Although walnuts are a common food source throughout the world, they are also employed in some herbal medicines. In China, they are used either raw or stir-fried. In traditional Chinese medicine, walnuts are associated with the Lung, Large Intestine and Kidney meridians, and have sweet and warm properties. Its functions are to tonify the kidneys, nourish the blood, warm the lungs and moisten the intestines. Typically, walnuts are used to treat pain and weakness in the knees and back, aid in digestion, and relieve asthma. Recent evidence suggests walnuts may play a role in lowering blood cholesterol levels, thus reducing the incidence of some forms of heart disease. How much walnut should I take? The typical dose of walnut ranges from 9 to 50 grams, depending on the condition being treated. They can be consumed raw or cooked. What forms of walnut are available? Walnuts are available in an overwhelming number of forms. 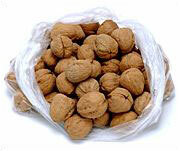 Raw, uncooked walnuts (either whole, crushed or powdered) can be found at most supermarkets and some health food stores. Walnut powders can be found at some herbal shops, and walnuts are often found in herbal formulas used to treat constipation and nausea. What can happen if I take too much walnut? Are there any interactions I should be aware of? What precautions should I take? Excessive amounts of walnuts may cause diarrhea in some individuals; therefore, patients with loose stools and diarrhea should be careful to watch their walnut consumption. In addition, walnuts are high in alpha-linolenic acid, and some studies have found that high dietary levels of alpha-linolenic acid can lead to an increased risk of prostate cancer. As of this writing, there are no known drug interactions with walnuts. As always, make sure to consult with a licensed health care provider before taking walnuts or any other herbal remedies or dietary supplements.